New, bigger&better scans of the stories from the same issue (with HAG fc+bc added), uploaded over 5 years ago. Synopsis: Camilla hears that Senga (an evil Zombi queen that reportedly can not die) has declared that K'Bali must die. 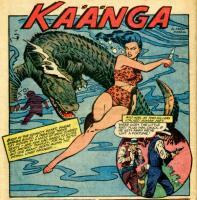 She rescues K'Bali from a leopard and sends a message that K'Bali will tell Senga's secrets. Senga kidnaps him and gives K'Bali a knife and tell him to kill her so that she can prove that she can't be killed. K'Bali is suddenly paralyzed and falls into a pit and is killed by wild beasts. Camilla figures that the weapon must have been poisoned and challenges Senga to a fight. Senga dies when Camilla dodges and she falls into the same pit that K'Bali fell into. Credits: Pencils: Fran Hopper (see notes) | Inks: Fran Hopper (signed); ? Credits: Pencils: John Celardo | Inks: John Celardo; George Evans ? ; Maurice Whitman ?